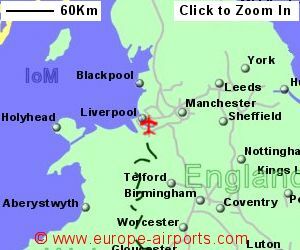 The nearest train station to the airport is Liverpool South Parkway at a sitance of 3Km. Liverpool central rail station is about 10Km from the airport. A dedicated bus service runs beetween the airport and South Parkway station (10 minute journey running every 15 minutes most of the day). National Express bus services include Liverpool (from 2 pounds), Leeds (from 12 pounds), Manchester (from 8 pounds), Bradford, Oldham, and Birkenhead. Terravision run a bus service to Manchester city centre, the 50 minute journey costing 8 pounds. The 20 minute taxi journey into Liverpool is likely to cost 15 - 20 pounds. 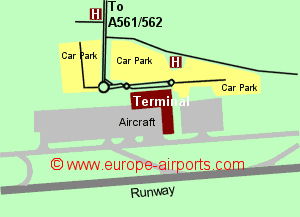 Short term car parking is located adjacent to the airport terminal while long stay parking is within 500m. Liverpool airport has 10 bars/cafes/restaurants, 9 shops, money exchange, an executive lounge, conference facilities, Internet access kiosks, and WiFi Internet access. The Hampton by Hilton hotel lies 200m from the terminal building. A Holiday Inn Express Hotel and Premier Inn are located within 500m of the terminal building. The art deco Crowne Plaza Hotel, which was in-fact the terminal building until 1986 (opening as an hotel in 2001) is located 1.5Km from the current terminal and runway. 4.9 million passengers were handled Liverpool airport in 2017, a 2% increase from the previous year.